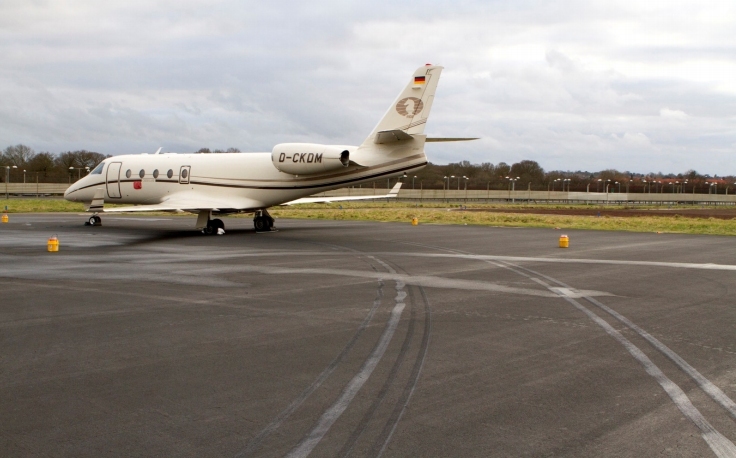 The crew of a Gulfstream G150 corporate jet rejected the takoff from Northolt Airport, London just before V2 speed because the airplane failed to rotate. A report by the U.K. AAIB details the serious incident that happened on February 6, 2011. A takeoff was attempted from runway 25 at Northolt Airport, London. When the commander pulled the control column back to rotate at rotation speed, VR, and subsequently fully back, the aircraft only pitched up to 1º. The takeoff was rejected just before V2, full braking was applied and the aircraft came to a stop at the end of the paved surface. A fire broke out around the left main wheels which was suppressed quickly by the Rescue and Fire Fighting Service (RFFS). The flight data showed that the aircraft’s acceleration during the takeoff roll was below normal but the investigation did not reveal any technical fault with the aircraft. The most likely explanation for the lack of acceleration and rotation was that the brakes were being applied during the takeoff, probably as a result of inadvertent braking application by the commander, which caused a reduction in acceleration and a nose-down pitching moment sufficient to prevent the aircraft from rotating. However, it could not be ruled out that another factor had caused partial brake operation. A similar occurrence led to a fatal accident in Yaroslavl, Russia on September 7, 2011 when a Yak-42 passenger plane crashed on takeoff when the airplane stalled. Forty-four occupants died in the accident. Investigation revealed that one of the crew members probably activated the brakes during the takeoff roll. In the case of the Gulfstream incident, the AAIB reiterated two safety recommendation issued to EASA in 2009 pertaining specifications for a takeoff performance monitoring system which provides a timely alert to flight crews when achieved takeoff performance is inadequate for given aircraft configurations and airfield conditions.